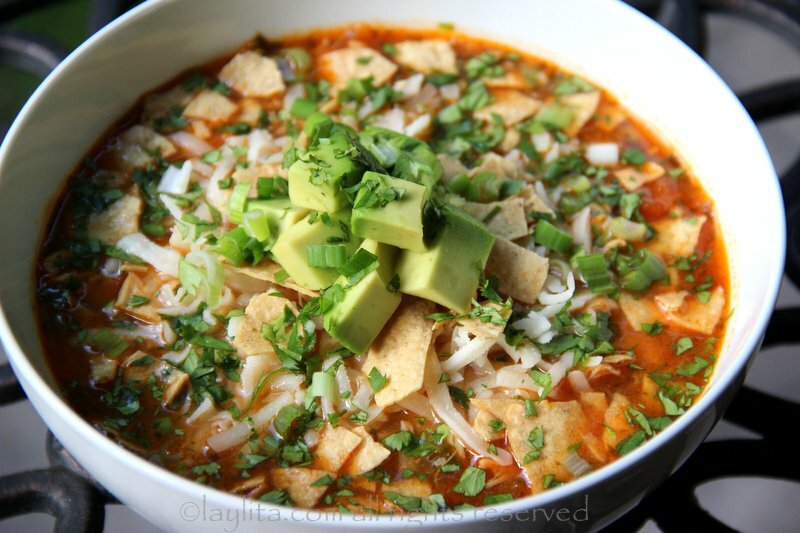 This spicy tortilla soup recipe is made with chicken or turkey, cilantro, onions, garlic, jalapeños, tomatoes, spices, poultry stock, and lime juice. 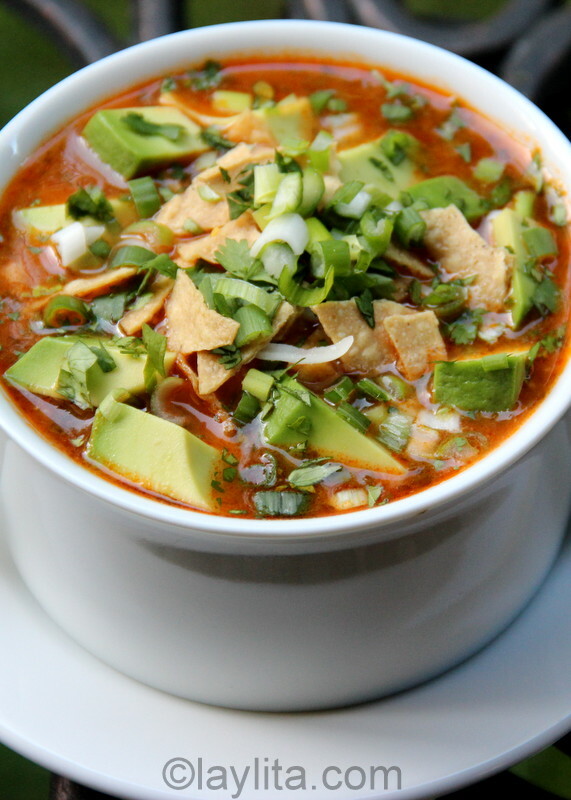 This soup is served topped with monterrey jack cheese or queso fresco, tortilla chips, and avocado. 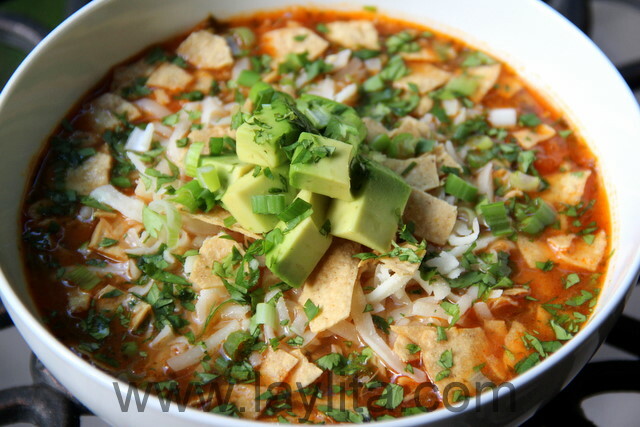 Tortilla soup is usually made with chicken; however it’s very easy to also make it with turkey, and especially during the holiday season it’s a great way to use any Thanksgiving turkey leftovers. 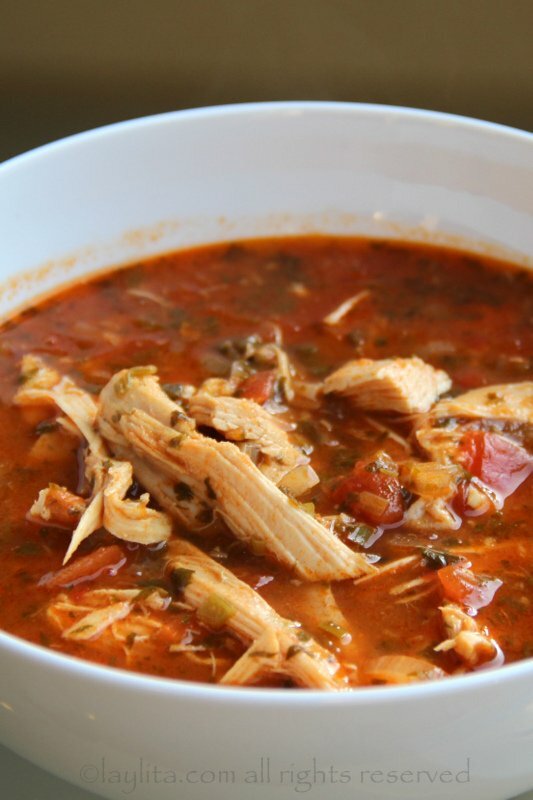 My uncle Clarence makes the best chicken tortilla soup, and he shared his family recipe – which I’ve slightly adapted using leftover cooked turkey or chicken. 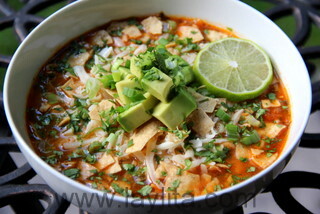 In his original recipe, he has a regular version and a “wild stuff” version of tortilla soup. The “wild stuff” version doubles the amount of cayenne pepper and uses the jalapeños with seeds/membranes included. I’ll let you decide which version you prefer, the regular one is spicy enough to make you feel it, without bringing tears to your eyes. 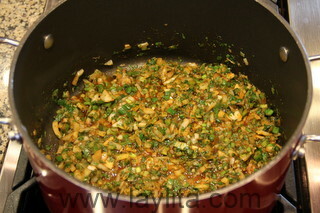 Also, you can always add additional lime juice to help lower the spiciness level. 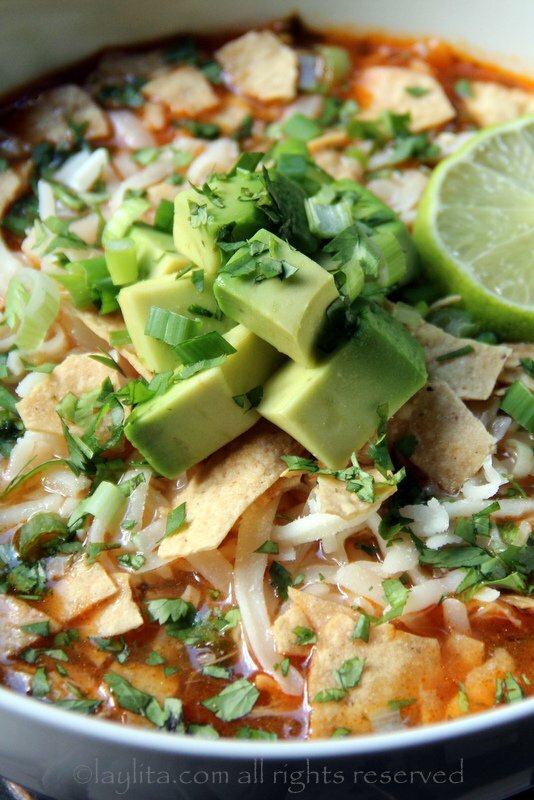 Tortilla soup recipe made with chicken or turkey, cilantro, onions, garlic, jalapeños, tomatoes, spices, stock, lime juice and served with monterrey jack cheese, tortilla chips, and avocado. Heat the oil in large pot, add the onions, green onions, cilantro, jalapeños, crushed garlic, paprika, cayenne pepper, oregano, sugar, salt and pepper. Mix well and cook on low heat for about 10 minutes. 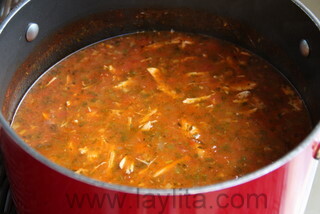 Add the turkey or chicken stock, tomato juice and shredded turkey. Bring to a boil, reduce the heat and simmer for 10 minutes. 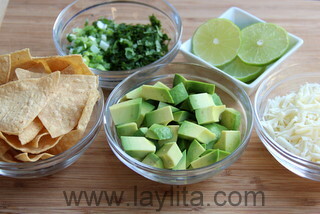 Serve garnished with the grated cheese, tortilla chips, avocado, cilantro, green onions and lime slices. I used store-bought chicken stock for this recipe, however you can also make turkey stock from the turkey bones if you want extra turkey flavor. 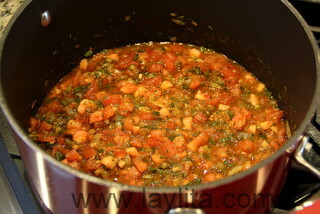 The base for this soup is what it gives it flavor: onions, cilantro, garlic, jalapenos, spices and tomatoes. 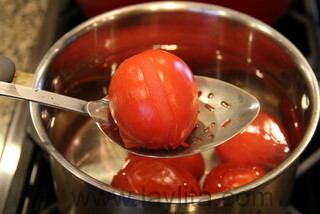 It’s best if the tomatoes are peeled, this way you won’t end up with pieces of tomato skin in the soup. 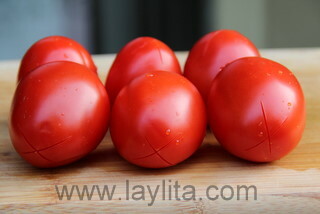 An easy way to peel the tomatoes for this soup – or for any other recipe where you need peeled tomatoes – is to make a cross cut on the top the tomato. 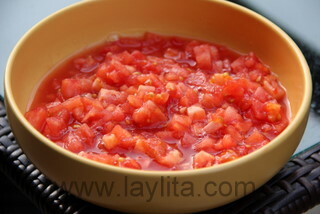 Bring a pot of water to boil, add the tomatoes to the boiling water, remove them from the hot water as soon as you see the skin start to peel off where you made the cut, and put them in cold water. Then you can easily peel the tomato skin off. Riper tomatoes will peel very quickly, while the firmer ones might take up to a minute or two in the boiling water before they start peeling. 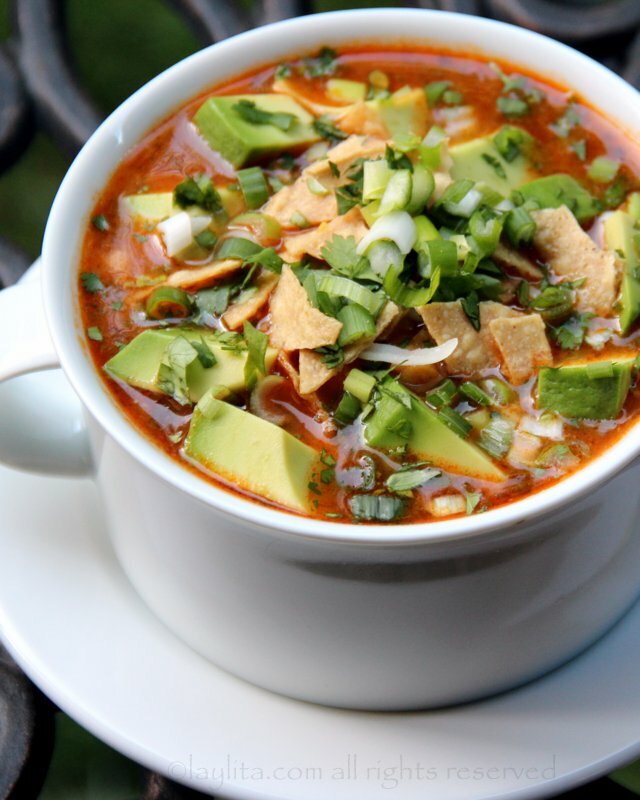 Must-have garnishes for tortilla soup include grated or shredded monterrey jack cheese (or queso fresco), tortilla chips, and avocado. 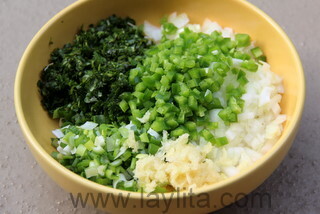 I also like to add some additional fresh cilantro, green onions and lime. I make this Every. Single. Winter!!! Everyone loves it! 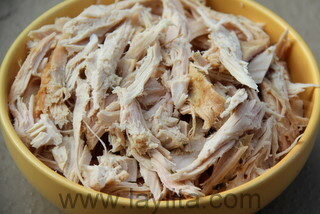 I stumbled across this recipe when seeking out new recipes for using turkey leftovers. Wow! So delicious! Just the right amount of heat and full of flavour. Will definitely make again! I made this last night. It was really good but thought that half a cup of lime juice was too much as the lime flavor overpowered the soup. Any advice to cut the lime flavor in my leftovers? 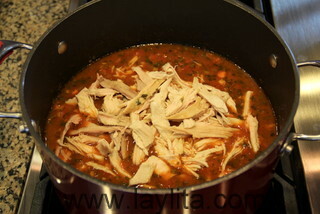 You can add some chicken/turkey broth to the soup – I’m updating the recipe to include a range of lime juice or just serving the soup with lime on the side. Thank you, it was ok the first day, but beyond good the next day!!! Hi, I just wanted to say this recipe has to be one of my favorite soup recipes to date! Exceptional work and thank you for sharing! Made this tonight. Awesome taste and delicious! Definitely will make again. Pretty much followed recipe to a T. It is so good! In searching for ways to use the remainder of my turkey, I stumbled upon this recipe. WOW, this is some of the best soup I have EVER tasted/made. Thank you for such a wonderful recipe! This will become one of my staples! Love, Love , Love this soup. Third year in a row. Couldn’t wait till thanksgiving this year!!! My family of four were happy with this soup. It had nice flavors. Hola Iva – Si tienes alguno que se parezca al quesillo seria perfecto o tipo mozzarella pero no el super fresco. La cebolla amarilla es como la perla, pero un poco amarilla (es mas dulce cuando se cocina), y la verde es la de hoja. Saludos! Pues acabo de servir tu sopa y recibí muchos cumplidos. Me olvidé de la carne y la puse en el último segundo jajaja pero quedó deliciosa! I made this tonight and my family loved it! I added corn and used rotel instead of tomatoes. I also used Swanson Mexican tortilla broth. This was a simple recipe that I look forward to trying again. This soup is so delicious! My family, guests, and I couldn’t believe how wonderful it was. Everyone loved it. I made turkey stock from the carcass then picked off the meat from that and added some more leftover meat. I also made a vegetarian version for one person with the same sofrito and tomato juice but added vegetable broth and chicken-less strips. She loved it, too! Found this recipe through Pinterest and it is fabulous. Changed the recipe to shredded chicken and it has become a weekly staple! I love this recipe, thanks for sharing! Shared the leftovers with a co-worker the next day. He threw the spoon down in shock and awe at how good it was. 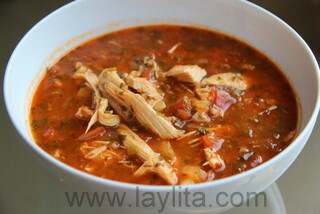 Best chicken tortila soup I have evr have and I live in Southern CA where there is a mexican restaurant on every corner. Killer recipe. Thank you! Made this for dinner. It was amazing. Great flavor. The avacado makes it. Will definately make again. The food was smelling so good after the first 11 ingredients, that we just had to try it with a tortilla chip. My family of 4 decided that this needs to be remade for just pico & chips using the first 11 ingredients and the first 2 steps in the instructions. Just add the tomatoes & remove from the heat. Soup is super good and great as leftovers. I am enjoying this wonderful and delicious soup! Perfect for the cold weather. Thank you so much for your recipes. They make me and my family happy. 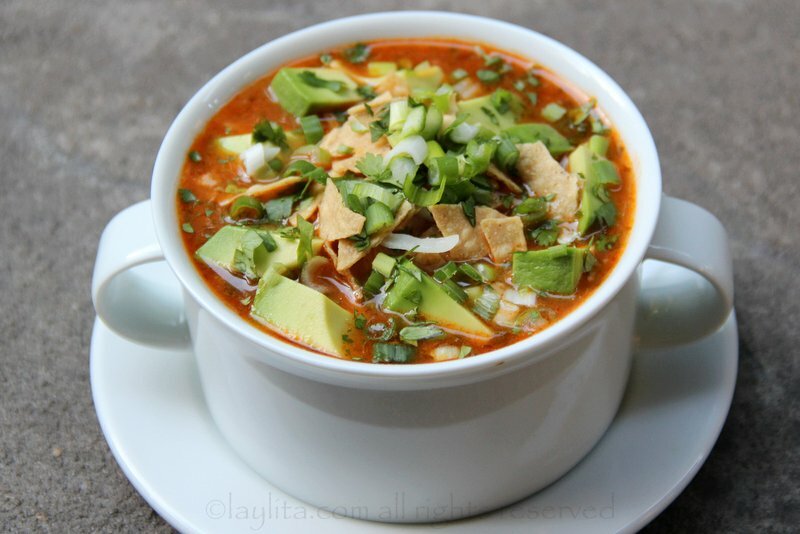 Always wanted to make Tortilla Soup. Made it today with the leftover turkey and wow this recipe was easy and delicious. Laylita strikes again! I have been a fan for a while, but this is my first time posting. We literally just finished eating this, and my only regret is that I did not double the recipe so we could all have seconds! I took this recipe a step further and added a dollop of sour cream to my bowl, and, as my husband would say…riquisima! My suegra loved it, too! My husband is from Guayaquil, and your site is where I go when I want to make him something special. Thanks for all you do and keep up the awesome work! Hi Tamika – Thanks for the feedback, glad to hear you (and the suegra) liked it! Very nice easy recipe. Turned out great & very fast & simple to make. I boiled a rotiseree chicken carcass with vegetables & whatever else I could find in the fridge all day to make a stock to add a PUNCH of flavor. Enjoy…. I made this last night and used Chicken instead of Turkey, just because that’s what I had on hand. It was delish! I’ll definitely be making this one again. Made this tonight and it was amazing. I needed to use up all my farmers market leftovers and some chicken from last night. This was PERFECT and so so tasty. THANK YOU! I made this with chicken last night to bring to work with me this week. It’s great for weight watchers, lots of veggies, protein, and avocado for just the right amount of fat…thanks for the recipe , so delicious! The pics are just wonderful and beautiful and so perfectly composed. I added this dish to my recipe round-up on my blog! Oh my goodness, how delicious!! I just made this for lunch today and it was fabulous! I substituted the turkey with chicken and used queso quesadilla cheese. So yummy, thank you! Delicious! I made it last night for dinner. Wonderful! I love the freshness of avocado, cilantro, green onions and lime! 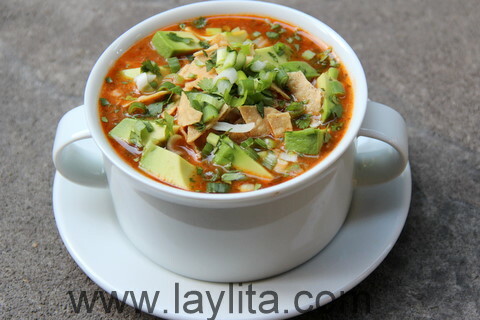 Laylita, this looks divine…and I am very glad you are back.